Blog / Why are People Moving to Georgia? Why are People Moving to Georgia? Georgia’s population has been growing. According to AJC, in 2016 Georgia’s population increased by the 7th highest amount in the United States. Whether you move to Georgia for the beaches, unique cities or weather, Georgia has something for everyone. Weather: Mild winters and hot, tropical summers make Georgia an attractive place to live. The state sees an above average rainfall every year, resulting in gorgeous parks and flora throughout the state. Beaches: Partly encompassed by the Atlantic Ocean, Georgia is outlined with gorgeous beaches. Georgia is the home to Tybee Island, St. Simons, Jekyll Island and Cumberland Island. Tybee Island is a popular film location, as Baywatch and the Last Song were shot on this beautiful island. 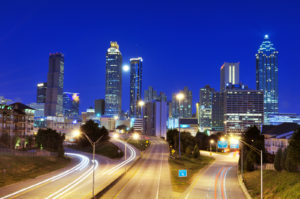 Low Cost of Living: According to Sperling’s Best Places, Georgia has a relatively low cost of living as compared to average states in the United States. A one-bedroom apartment in Georgia would cost on average $716, while elsewhere in the United States it would cost about $825. History: Georgia is dripping with American history. Anderson Prison, Battle of Pickett’s Mill Fort McAllister, Fort Pulaski and the National Civil War Naval Museum at Port Columbus are all located in Georgia. Thousands of tourists and history buffs alike enjoy visiting these historic sites to learn more about our American history. Savannah, GA: Millions of visitors flock to Savannah every year to experience this historic city. Whether you are coming for the food, the aquarium, beer tasting or sites, Savannah is sure to have something to please you. As one of the most haunted places in America, Savannah offers various ghost tours to tourists. Savannah is also the home of a 1920’s style speakeasy. To get into Mata Hari’s you must have a key. Atlanta: The city of Atlanta is booming. According to Penske Top Moving Destinations, Atlanta, Georgia was the number 1 moving destination of 2016. Within recent years thousands of people have flocked to Atlanta to live. The city has a low cost of living making it a very desirable location. Atlanta, GA is home to manyattractions like the World of Coca-Cola, Atlanta Botanical Gardens and Fox Theater. Fortune 500 Companies: According to Atlanta Patch, in 2017, 17 Fortune 500 companies have called Georgia home. Seeing the opportunity for jobs, people have clustered in Georgia, or mainly Atlanta, to get a chance to work for one of these ginormous powerhouse companies. Have you Recently Moved to Georgia or are Planning to Move? Whether you moved to Georgia for the weather, low cost of living or to be close to a unique city, Storage World has a storage solution to help you. Stop in and visit one of our locations today!